G705 entry in the phone business. Support HSDPA network so the strength of this main model. But not only that, Reliability in the connection and also the completeness of entertainment sector also participate. On average, the generation business marketed sponsor Sony Ericsson is the strength of data access features of the office itself. What is with the G705, is better than the previous series? Capacity or as a mobile office decreased? Sony Ericsson G705 mobile phone features such as fashion models. With slide design, with a glossy plastic material on the front, while the colors have a light bulb behind the rubber does not make it slippery. Generation business in the Sony Ericsson, G705 slide construction is the first. Solid body color with black, looks quite elegant. Suitable for the business. However, a light weight phone to phone more appropriate fashion, the normal swing in the neck. Mode when the slide is opened, you will find in the standard keypad with a soft rubber material. Although a little flat and the structure is quite a meeting, but when pressed, will feel comfort sensation in the hand fingers. And of course of action will make the writing more cool message. Primarily the ability to show as "Generation Web", the phone does not forget to put some quick buttons for easy surfing the internet. Position integrates with the digital keypad on the right line, plus the icon has a unique purple LED that will light when opening the home page. Sony Ericsson G705 uses transflektif resolution display 262,144 colors, with resolution of 240 x 320 pixels (QVGA). Quite bright and clear when used to display images. 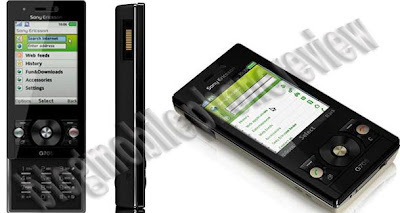 However, the technology does not support touch (touchscreen) such as Sony Ericsson series of other business. Sony Ericsson G705 does not support operating systems such as Sony Ericsson G700. So for the interface, this mobile phone back to the standard model. Interestingly, there was little innovation in the display, namely the presence of special effects that resemble flash menu. Menu structure also provides some new look, not only the grid. There is also a model and rotating single icon. More fun, the Sony Ericsson G705 interface is a combination of model Media center, Walkman 3.0 music player interface and camera Cyber Shot SE v2.0 is the latest, as Sony Ericsson G502. It seems, this model will still be maintained in Sony Ericsson for the next generation of high midle. "Generation Web" is the ability to access the virtual world, as well as Sony Ericsson G705. For this purpose, G705 has HSDPA network support. Fair is fast and stable in processing data. and of course, all business needs are more easily executed. Including 3G services, such as video call and streaming video. For the browser, Sony Ericsson G705 uses NetFront v3.4. Not only format via the WAP 2.0 XHTML, HTML pages can also be full. Interestingly the browser view more "colorfull" plus chain link to online content. Although the stronger side in the business, but Sony Ericsson G705 still spoil the user with the rather good entertainment, such as "Media Center" is. Support Music Player 3.0 software and the Walkman Player 3.0 which is the same as the Sony Ericsson Walkman series, have an effect on the interface the same. Unfortunately, audio is out of the loudspeaker still impressed even. While the features Mega Bass and stereo widening has been activated. This is a weakness that is found on many Sony Ericsson mobile phone. However, the vendor is smart enough to minimize the lack of this quality stereo headset respite. Through this device, the music boom out more forceful. Trebel bass sound is very clear and audible. Excellence is in the next camera, 3.2 megapixel with strength. Such as "Media Center", the camera also get a touch of a typical mobile phone Sony Ericsson, a Cyber-Shot only. This is seen from the viewfinder and the interface settings in the model, the same generation with the Cyber-Shot. Unfortunately, image quality is far from perfect. In fact, there is no autofocus on the Sony Ericsson G705 dismal performance camera phone. Room for the light level is less good (indoor), the images are still a lot of noise decorated. Although the flash is activated, the results are still less well. However, for the location of the light enough, tolerable good photo results. As the series Cyber-Shot C702 and C902, Sony Ericsson G705 also features the photo Tagging. Here, you can add information about the location of the image through a special icon. In fact, if connected with a GPS receiver, you can display the location shooting directly from a digital map, such as Google Maps. This is a navigation service subscription so that middle-class mobile phone Sony Ericsson. Features A-GPS based on this digital map from Google Maps. Meanwhile, the ability to navigate the software trusted to Wayfinder Navigator 7. Fair reliable guide for traveling. Sony Ericsson to bring all the weapons needed for the media connection. There are WiFi 802.11 b / g, Bluetooth v2.0 (A2DP) and a data cable with the connector end of the traditional Sony Ericsson. In addition to facilities that have a comprehensive enough, Sony Ericsson G705 is also still considering the power provider. Lithium Polymer type of battery that brought the phone can provide to activity time 2-3 days. For business data and browsing, HSDPA network that supported Sony Ericsson G705 is quite strong. Moreover, the design is the rather elegant. In addition, the presence of WiFi connection in the path and support A-GPS features plus at least several generations of collaboration can improve the performance of the phone. However, loss of business applications and some other features added by the official price is still expensive feel, should also be considered. 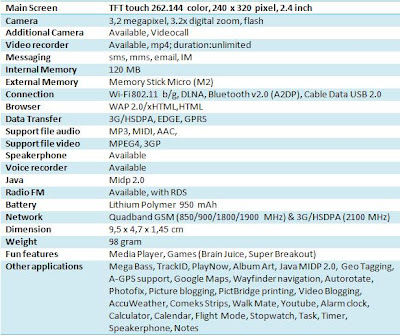 Because, at the same price level, there are many types of mobile phones that are far more complete and powerful.